February 18, 2016, New York, NY – Japan Society Gallery in New York will present In the Wake: Japanese Photographers Respond to 3/11 opening on Friday, March 11, 2016, five years to the day since an enormous earthquake and tsunami struck northeast Japan, devastating coastal regions and setting off nuclear power plant failure. On view through June 12, 2016, the exhibition is the centerpiece of an institution-wide observance of what was the most widely photographed catastrophe in history. First organized by the Museum of Fine Arts, Boston, where it was on view in 2015, In the Wake features more than 90 photographs, videos, and installations created by 17 artists who contemplate what has been lost and what remains in the aftermath of a national tragedy that took some 18,000 lives and displaced another 400,000 individuals. The reconceived and expanded presentation at Japan Society is divided into three sections, focusing on documentary approaches to the disasters, experimental uses of photographic techniques in search of a 3/11 iconography, and the development of a visual narrative for Tohoku, the Northeastern region of Japan hardest hit by the earthquake. In charting a gradual progression from objectivity to experiment and metaphor, the Japan Society Gallery’s installation of In the Wake emphasizes transformations in Japanese artists’ practices since 3/11 for the first time in a major U.S. exhibition. Japan Society is also delighted to announce that Yoko Ono’s internationally celebrated artwork Wish Tree (1996 – present) will be installed in its iconic foyer as part of In the Wake. Ono, who was born in Tokyo and grew up there during World War II, engages audiences in an open collaboration by inviting them tie their written wishes on the branches of an apple tree in hope for a brighter future. As with the more than one million wishes gathered worldwide, those from Japan Society will be collected at the end of the exhibition and buried at the base of the Imagine Peace Tower on Videy Island, Iceland. Ono was the recipient of a Lifetime Achievement award from Japan Society in 2005. “We are deeply honored to have the opportunity to exhibit Yoko Ono’s Wish Tree at Japan Society as part of our institution-wide commemoration of March 11th. As an international symbol of peace, no other work of art resonates so universally and at the same time speaks to the power of human resilience. Our hope is that Wish Tree will forge an emotional and spiritual connection to the people of Japan on this historic anniversary,” said Yukie Kamiya, Gallery Director of Japan Society. Another highlight of In the Wake is the expanded, room-sized installation dedicated to Munemasa Takahashi’s acclaimed project, Lost & Found, which is on view in New York for the first time. Situated along a curved wall at the end of the North Gallery, the floor-to-ceiling installation is comprised of lost personal snapshots recovered from the debris in Tohoku by Salvage Memory Project, a volunteer effort organized by Takahashi after the tsunami. The images – a symbolic collection of memories – are a poignant reminder of life’s fragility. To date, Takahashi and his team have amassed more than 750,000 photos, tens of thousands of which have been identified and returned to the families, and nearly 1,000 will be presented in the Japan Gallery installation. The artists presented in In the Wake are: Takashi Arai (b. 1978), Nobuyoshi Araki (b. 1940), Ishu Han (b. 1987), Naoya Hatakeyama (b. 1958), Takashi Homma (b. 1962), Kikuji Kawada (b. 1933), Rinko Kawauchi (b. 1972), Keizo Kitajima (b. 1954), Kōzo Miyoshi (b. 1947), Yasusuke Ota (b. 1958), Masato Seto (b. 1953), Lieko Shiga (b. 1980), Munemasa Takahashi (b. 1980), Shimpei Takeda (b. 1982), Masaru Tatsuki (b. 1974), Daisuke Yokota (b. 1984) and Tomoko Yoneda (b. 1965). In the Wake begins in the Sky Gallery with mesmerizing large-scale projections of before-and-after shots by master photographer Naoya Hatakeyama of his small coastal hometown, Rikuzentakata, which was devastated by the tsunami and where his mother lost her life on 3/11. Installed near Hatakeyama’s work is a project by Lieko Shiga. Like Munemasa Takahashi, Shiga also embarked on an effort to recover lost family photos and reunite them with their owners. A single large-scale photograph depicts the display of these personal tokens of memory that Shiga organized at a local relief center, and is accompanied by vitrines showcasing smaller black and white documentary photos of the original images with passages from Shiga’s personal writings during this time period. 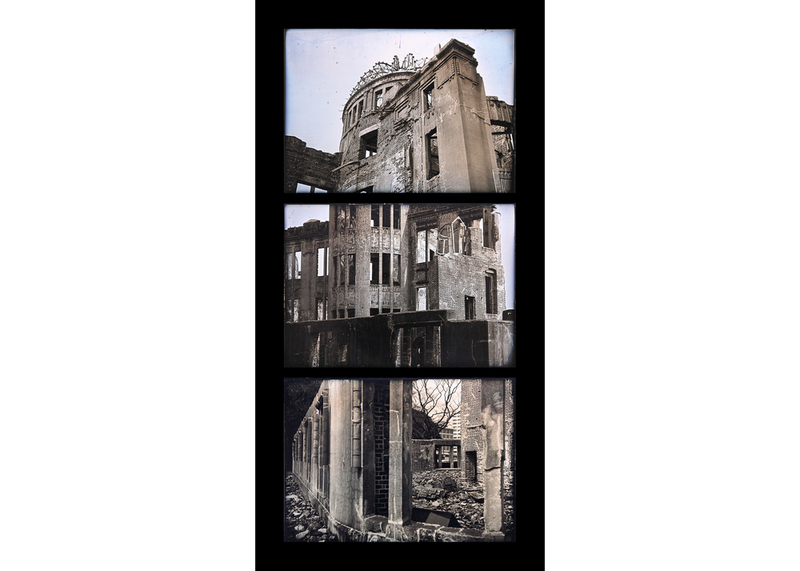 Although adopting very different approaches, Hatakeyama’s and Shiga’s pieces introduce viewers to the power of the photographed image in the context of the 3/11 disaster. Moving into the North Gallery, the viewer is confronted with diverse approaches to documenting the aftermath of 3/11. At first glance, a digital projection entitled Light and Shadow by Rinko Kawauchi presents a series of images of two birds as they circle in the sky above, land, and take flight once again. Upon closer inspection, it becomes apparent that the birds – one white, one black – are a pair of domesticated homing pigeons attempting to locate their home among the rubble. A number of the photographers featured in this gallery combine a straightforward approach to picture-making with metaphorical intentions. Works by Tomoko Yoneda (recently selected as a finalist for the prestigious 2015 Nissan Art Prize), Takashi Homma, and Shimpei Takeda are displayed here, the last of whom touches something ineffable in the human psyche by using contaminated soil samples to create autoradiograph images resembling the astronomical splendor of the night sky. Another highlight of the North Gallery is the large-format color photography of Naoya Hatakeyama. Before the 3/11 disaster, Hatakeyama had long been exploring the dynamic between nature and urban development. Afterwards, he went on to photograph the ravages, the cleanup, and the slow process of reconstruction of his hometown. The death of the photographer’s mother in the tsunami gives terrible new meaning to the series; one especially poignant photograph depicts a rainbow touching down on the spot where her house once stood. Keizō Kitajima is one of the photographers whose practice changed following 3/11. Known for his slick black and white images of Tokyo and New York nightlife from the 1970s and 80s, Kitajima’s impeccably composed, large- format color photographs of the trail of destruction left behind from the tsunami carry a weight and silence that stand in stark contract to his earlier work. A series of daguerreotypes by photographer Takashi Arai will be displayed in Japan Society’s intimate Bamboo gallery. To create these irreproducible images, Arai relied on the original 19th-century technique to capture fraught moments from Japan’s complex modern history, including images from the Hiroshima atomic bombing and the 2011 events at Fukushima. Arai is among the 2016 nominees for the 41st Kimura Ihei Award, which will be announced in March. The second section of the exhibition, at the beginning of the South Gallery, focuses on the work of photographers who have pushed the boundaries of the traditional image-capture function of the camera as a point of departure for responding to 3/11. Many have begun with quotidian images and transformed them into something hyper- real, even sinister. Five black and white images by Nobuyoshi Araki are an example of such experimentation. For the series, the acclaimed photographer violently slashed the negatives of black and white photographs in his studio: among them a shot of busy, umbrella-toting city dwellers crisscrossing a street and a glamorous torch singer in close-up on a TV screen. His actions are not only a record of emotion, but also an attempt to draw attention to photography’s propensity to both arrest and distort time. The celebrated emerging photographer Daisuke Yokota altered the development of a series of black and white negatives with various experimental techniques, producing a set of spare, enigmatic X-ray-like pictures. The subtle, gradated images evoke the hazy impressions recalled from memory rather than precise details. In 2015, Yokota was shortlisted for the Paris Photo-Aperture Foundation PhotoBook Awards and was the recipient of the John Kobal Residency Award at Photo London. He is also among the 2016 nominees for the 41st Kimura Ihei Award. The last section of the exhibition relates specifically to Tohoku, the northeastern part of Japan that was the epicenter of the disaster and a region that has long been perceived as an enchanted or mythic place. Featured here are photographs from a large-format color series entitled Rasen kaigan (Spiral Shore) by Lieko Shiga, who narrowly escaped the tsunami in Tohoku and returned to find that she had lost her house, studio, cameras, and a year’s worth of work. Her images purport to document the activities of the “village folk,” like one showing a bundled-up woman seeming to walk her bicycle down the crevice of a perilous, light-strafed cliff or another of an elderly couple posing next to the upside-down root of a pine tree that appears to pierce the man’s heart. Works from this series are concurrently on view in Ocean of Images: New Photography 2015 at the Museum of Modern Art, New York, through March 20th. PROGRAMMING Commemorating the 5th Anniversary of 3/11 February-June 2016 Marking five years since the triple disaster—earthquake, tsunami, and nuclear crisis—Japan Society presents an institution-wide series of programming that commemorates the tragic loss and fundamentally changed society, and examines the recovery process and the tremendous challenges that remain. In addition to Japan Society Gallery’s centerpiece exhibition In the Wake, events include the Local Innovators Forum in Tokyo (February 27), the symposium New Directions in Japanese Art & Architecture after 3/11 (March 11), the New York premiere screening of the documentary Nuclear Nation II (March 17), a reading of the play Girl X (March 21), and the artist dialogue Confronting Disaster with In the Wake artist Munemasa Takahashi (April 15), among others. A full list of events will be released shortly. A publication, In the Wake: Japanese Photographers Respond to 3/11 (2015, MFA Publications), by Anne Nishimura Morse and Anne E. Havinga, accompanies the exhibition, with additional contributions made by Michio Hayashi, Professor of Art History and Visual Culture, Sophia University; Marilyn Ivy, Associate Professor of Anthropology, Columbia University; and Tomoko Nagakura, Research Fellow for Japanese Art. The English edition of the book, which has also been published in Japanese, will be available at Japan Society. In the Wake: Japanese Photographers Respond to 3/11 is generously supported by Chris A. Wachenheim, Mr. Wilbur L. Ross, Jr., the Henry Luce Foundation, The Tokyo Club (General Incorporated Association), and the following corporations: ITOCHU International Inc., Marubeni America Corporation, Mitsubishi Corporation (Americas), Mitsubishi UFJ Financial Group (MUFG), Sumitomo Corporation of Americas, ITO EN (North America) INC., Mizuho Bank, Ltd., SMBC, Sojitz Corporation of America, and TOYOTA. Japan Society would also like to thank Louis J. Forster, Thierry Porté and Yasko Tashiro, The Japan Foundation, New York, and the following corporations for their generous contributions: Brother International Corporation, Canon U.S.A., Inc., Hitachi America, Ltd., IHI INC., Mitsubishi Heavy Industries America, Inc., Mitsui Fudosan America, Inc., Rockefeller Group International Inc., Sompo America Insurance Services LLC, Tokio Marine Management, Inc., UNIQLO USA, LLC, Kawasaki Heavy Industries (USA), Inc., Morgan Stanley, and Nippon Steel & Sumitomo Metal U.S.A., Inc. Additional support is provided by Mrs. Jane B. DeBevoise, Noriko Iwase, Yasuhisa Kumada, and Kiyoka Tanaka. Exhibitions at Japan Society are made possible in part by the Lila Wallace-Reader's Digest Endowment Fund, and Friends of the Gallery. Arts & Culture Lecture Programs are made possible by funding from the Lila Wallace- Reader's Digest Endowment Fund. Additional support is provided by Chris A. Wachenheim and the Sandy Heck Lecture Fund.